Last summer (2011) we decided to concentrate our efforts on some big infrastructure projects, two of which impacted on our firewood preparation and handling. The first was a simple landscaping job to rebuild a path across a steep slope so our trailer and garden mower can more easily get wood to the door of the house. The second, and more substantial job was to design and build our own firewood shed. Plans developed in a few stages and on these pages I outline our thought process and how the construction progressed. One burning season later and it is now obvious that both of these projects were a success. The first step when planning a firewood storage shed was to look around and see what types of structures others have been building. Simply looking on google image search will bring up lots of pictures but to my mind you really want to see what the pro's do. 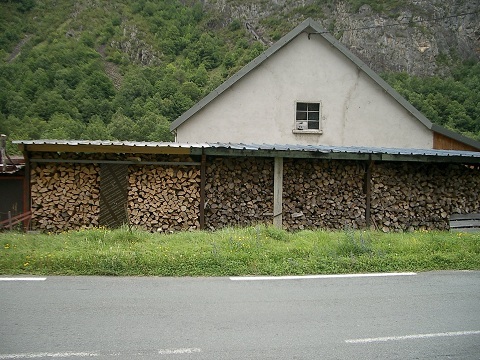 We holiday in France fairly regularly and, particularly in rural areas, it is quite common to see homes where firewood is their only source of heating. When you are relying on your wood you either learn to deal with it well or spend a lot of time feeling cold and frustrated! The first thing you notice about their sheds is the size. These aren't lean-to's tacked against one wall of the house; they are serious constructions sized to hold many years worth of fuel. Construction is usually very simple timber framing and salvaged materials are evident everywhere - why spend money when you can improvise from discarded junk? Typically these sheds have open sides but some kind of roof - enough shelter to keep the worst rain off but plenty of ventilation so the wood seasons well. IN this picture you can clearly see where wood has been added more recently; this is probably one year's worth (around 6 cords perhaps) and there are two more years worth of fuel seasoning ready for the coming winter. 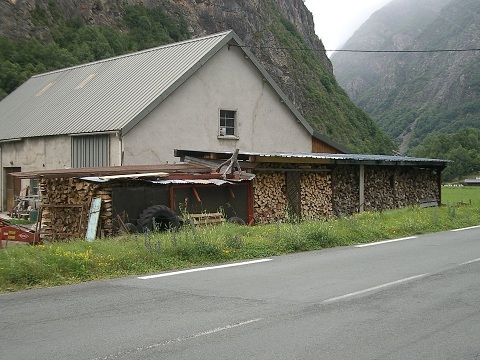 Clearly this guy doesn't enjoy trudging long distances in the snow to get his firewood; great access to both the road and to the door of the house. Having researched a whole bunch of different possibilities we brainstormed to work out what we wanted our shed to do for us, which turned into some simple design principals. location - ideally in a spot with good sun and wind. In practice we only had one possible place, we did work to improve the access though.